formerly Dickinson Central Mall 12 Theatre, Central Mall 12 (Showplex Cinemas, Inc.), Starplex Cinemas - Lawton 12, which changed to AMC Lawton 12 after AMC acquired Starplex Cinemas in 2015. 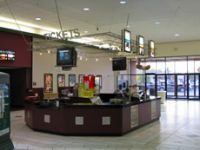 It transferred ownership to New Vision Theatres in 2017 and was renamed to the Lawton Central Mall 12. This movie theater is near Lawton, Fort Sill, Geronimo, Medicine Park.